At the start of the year I promised to release Version 1.0.1.0 of QxWT at the end of Febuary and doing releases on time is one of the most important things so that people can start to trust into your project. You can download the released code from the project release website or directly through this link. To get support for advanced grapics and animation support I started writing a JSNI-Wrapper for Raphael. QxWT comes with an addon module which provides direct integration of GRaphael into QxWT-Applications. The wrapper is in it’s early stage and the API in the flow. Which creates an image whose opacity attribute is animated from 0 – 1.0 in 1 second, advanced transitions, gradients and much more are possible as well. You can download the released code from the project release website or or directly through this link. 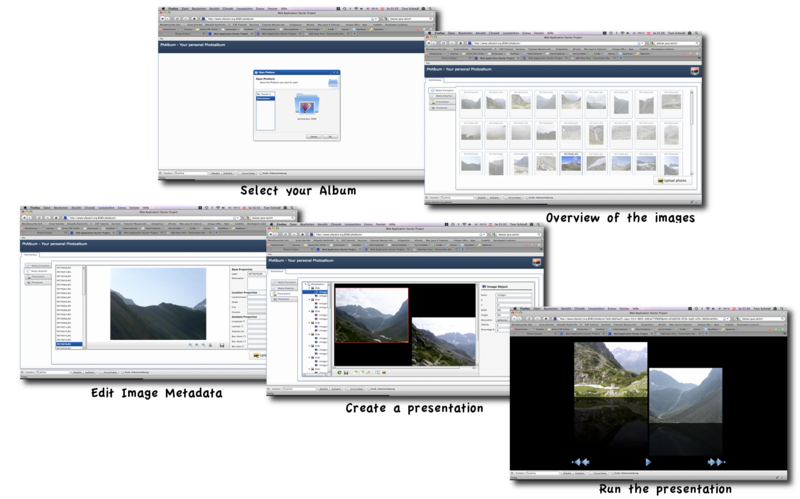 To show the potential of all this technologies I’m working on a real world example which simply allows a user to manage Photos, create Online-Presentations and in future also create printable PDF-Files (e.g. a calender, photo-album, …). I certainly miss a whole lot as I did no web work for years (but have some ahead). I a few words, what is the main benefit of using your qooxdoo binding compared to plain GWT? GWT yet has a very limited set of widgets so you need to use another UI-Widgetset. There are others like SmartGWT and GXT who have the same focus.